Crystal Atolls is a region in Palas State in central-west Irukandji, bordering Kalamat State. Southeast of Hephaistion (later Boyfriend Beach) and bordered on three sides by large bays, Crystal Atolls was predominantly residential on secluded seaside blocks. 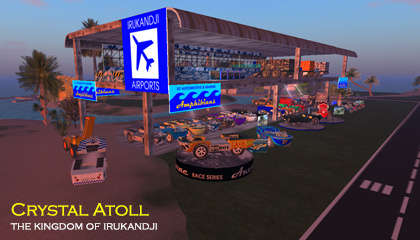 Its standout feature however was the enormous Irukandji Airport complex, which was moved from Hephaistion to allow for jet landings. 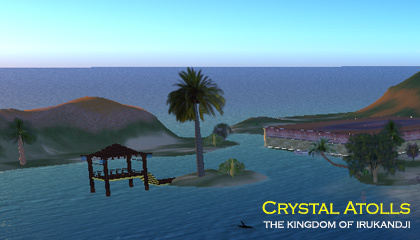 Crystal Atolls was also home to XT Automotive and Marine which was my inworld automotive business specialising in amphibious cars, trucks, and boats. 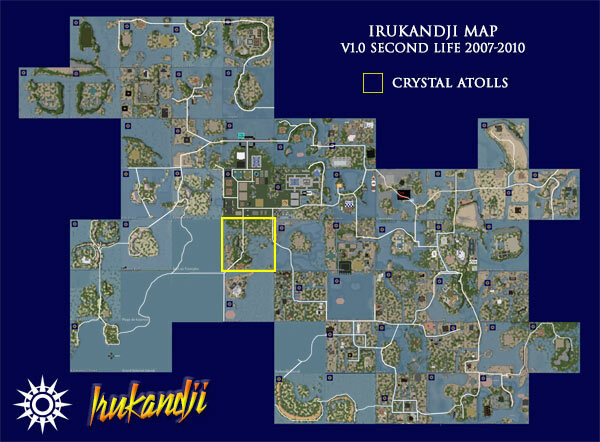 Despite Crystal Atolls' industry, its nearness to Hephaistion ensured that the sim remained picturesque and fitted in with the tropical island theme of greater Irukandji. Other regions that adjoined Crystal Atolls were Split Rock Mountain to the north, Baie de Citron in the east, Alantay Island in the southeast, Bay of Plenty to the south, Baie de Triomphe due west, and Aquitaine Bay to the northwest. A handful of photographs survive of Crystal Atolls below.